When life hands you lemons, make Frosted Lemonade. And Frosted Coffee, and Frosted Sunrise, and Frosted Key Lime. 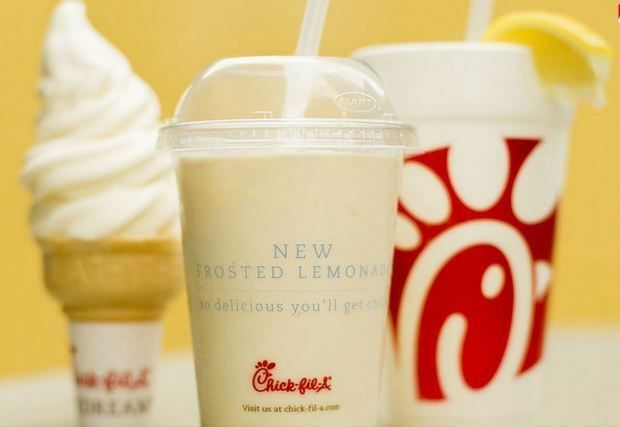 Chick-fil-A’s frosted beverages offer a variety of tasty treats for any time of day, from breakfast through snack time and dessert. What are they? They’re sippable and spoonable. They’re a sweet treat consisting of Icedream blended with a favorite Chick-fil-A beverage! What are they not? They’re not smoothies and not milkshakes, but instead are something special in-between. Here’s a breakdown of our frosted concoctions. Frosted Lemonade: It’s the frosted beverage that started it all, featuring our classic regular and diet lemonade (your choice!). It was long rumored to be a recipe created by Chick-fil-A Team Members to enjoy while on breaks. After hearing stories of the creative concoction, Chick-fil-A refined the recipe and launched it in the spring of 2015. Fans have told us they love the Frosted Lemonade as an on-the-go snack or treat that is lighter than a milkshake. Frosted Coffee: After guests declared their love for Frosted Lemonade, we started wondering what else we could combine with Icedream. Cue the Frosted Coffee’s arrival in 2016, featuring THRIVE Farmers cold-brewed ice coffee! It’s a sweet treat with a caffeine kick, and we’re not sure how we got through the morning (or afternoon) without it! Frosted Strawberry Lemonade: We know, we know. Just when you thought our Lemonade was a tasty-enough mix-in, we discovered another delicious flavor; a wonderful combination of sweet, tart and satisfying. We offered this next-level treat in 2017 during strawberry season, and you’ll have to stay tuned for whether we bring it back again another year. Frosted Sunrise: It was only a matter of time until we found something else to “frost.” We think we’ve hit the citrus jackpot with an icy treat to frost them all – Frosted Sunrise combines Icedream with SimplyOrange® to create a cool, sweet, tangy treat that had Florida seeing orange during a test in 2017. The good news is that the orange groves have spoken, and Frosted Sunrise is available nationwide for the Spring and Summer seasons! Frosted Sunrise is the perfect complement to your Chicken Biscuit, or Chick-n-Minis, or Grilled Market Salad, or Grilled Chicken Cool Wrap… ok, we’ll stop now. But you get the picture. Frosted Key Lime: But wait – there’s more. The newest addition to the Chick-fil-A frosted family will be available starting Monday March 18, 2019 for a limited time. The Frosted Key Lime provides a unique, sublime taste thanks to a new, all-natural key lime flavor. This latest seasonal sensation is a hand-spun combination of vanilla IceDream®, Lemonade (or Diet Lemonade) and a natural, sugar-free lime flavoring made with key limes, kaffir limes and Persian limes. The new beverage was tested in Austin in October 2018, and was so appealing that it only made sense to let the rest of the nation enjoy this tart treat for the spring season of 2019! That brings us to 2019 and beyond – we’re hooked, and we may never stop! What other Chick-fil-A beverages should we frost next? Does Chick-fil-A Serve Fish During Lent? Download the app. Bypass the line. Enjoy Chick-fil-A faster than ever. We should be about more than just selling chicken: we should be a part of our customers’ lives and the communities in which we serve.